If you’re anything like me, you have been victim to that little voice calling your name from the freezer when there is some cookie dough in there chill’n. Which is why I don’t keep cookie dough in my fridge! I can’t eat what I don’t have! I was up late working this week and my sweet tooth was yelling– give me chocolate! 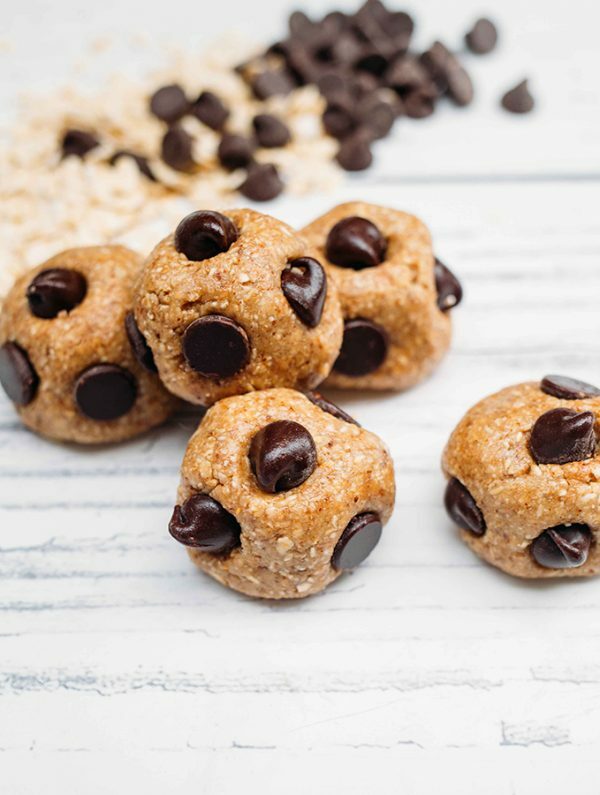 So I decided to make some healthy chocolate chip cookie dough bites. Yup, that’s right, and they are oh-so-delicious! This no bake cookie dough is as clean as cookie dough can get. Chocolate chips are chocolate chips, but the rest of the ingredients are clean and healthy. If you cant enjoy a handful of chocolate chips every once and a while, why even wake up? 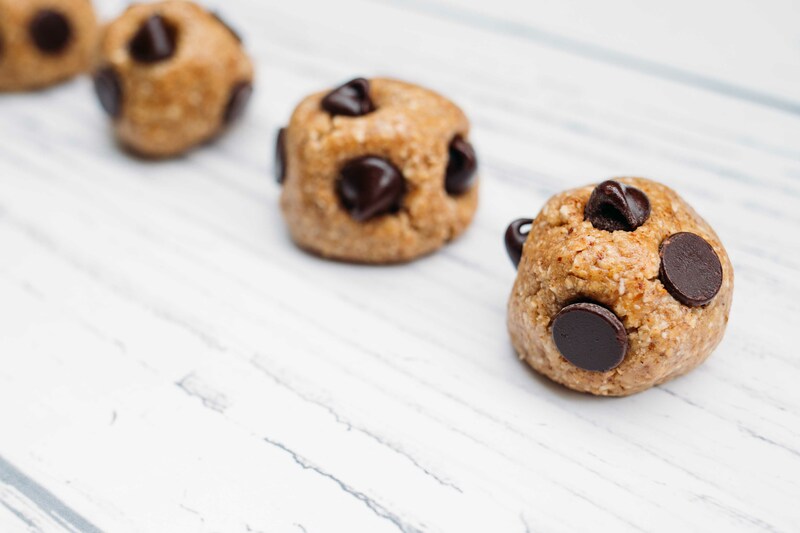 Ok, that might be a bit extreme, but these are a great way to curb that sweet tooth in a much healthier way than diving into a tub of real cookie dough. These will leave you with the #sorrynotsorry kinda feeling– you’re welcome in advance. Blend oats on high until they become a fine powder, place in a small mixing bowl. Add gluten-free flour and flax meal, mix. In separate bowl whisk, vanilla extract, almond butter and melted coconut oil. Add flour mixture to the wet ingredients a little at a time, stirring as you go. Use a rubber spatula to scrape sides of bowl and work into mixture. Once dough is completely mixed, roll 1 inch balls with hand and add about 5 chocolate chips into the ball. There should be enough dough for about 5 bites. * You can sub all purpose gluten-free flour for any GF flour of your choice or add an additional 2 Tablespoons of oat flour. 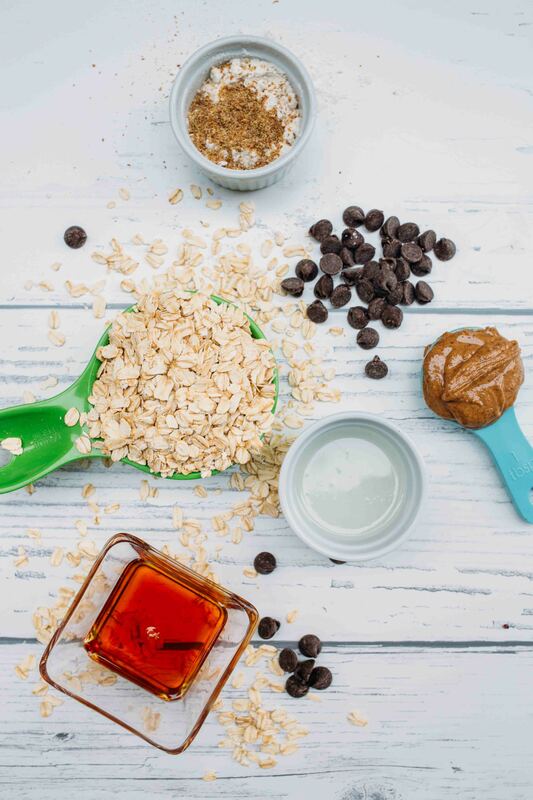 * I personally LOVE using almond extract- so if you like that flavor try it out. * You can sub the coconut oil with 1 Tablespoon unsweetened applesauce, if you're trying to cut down on oil consumption. *Option to top bites of with a tiny dash of Himalayan salt. Oat flour is really easy and cheap to make. Just take dry rolled oats and put them in a high powered blender or food processor. Because of the ease of making it and the price, oat flour has become a staple in our house… I use it A LOT! Also if you’re too lazy to roll the bites, just eat it straight outta the bowl! I may have made this recipe a few times since creating it, and one or two times I might have skipped the rolling step and just grabbed a spoon 😉 But if nobody saw me, I don’t have to admit to it right?